The frangipani flower, a flower also referred to as plumeria, is a tropical flower most often grown in the Caribbean and Mexico. In Hawaii, these flowers are sometimes grown to be used in making leis. Frangipani flowers come in shades of pink, white and red and are very fragrant. 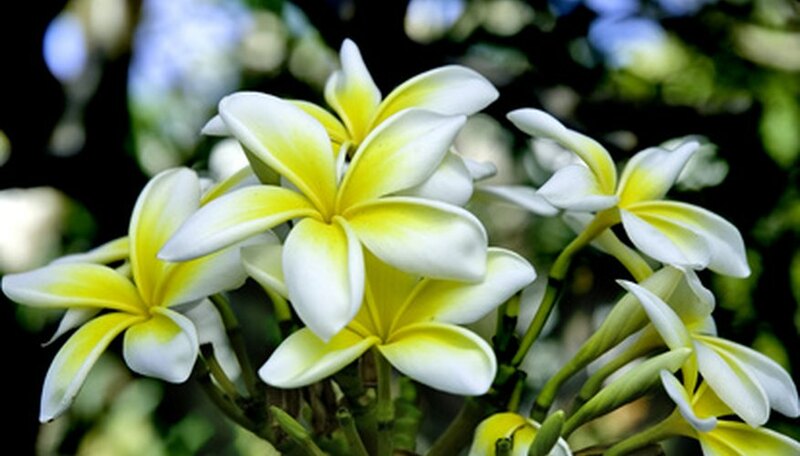 Like any flower, frangipani flowers can be dried, allowing you to enjoy their beauty all year long. Drying flowers is a pretty simple process. Cut frangipani flowers and attached stems from the plant. Use a clean pair of garden shears to cut as much of the flower and stem as you would like to preserve. You can preserve the flowers only, or the flowers with their stems attached, so they can be used in dried flower arrangements. Gather the flowers together so the ends of the stems of each flower meet. Cut a piece of string. The string should be long enough to tie the flowers together while still leaving enough to hang the flower bunch. Tie one end of the string around the stems and make a secure knot. Suspend the flowers upside-down in a dark, dry room such as an attic or closet. Tie the untied end of the string to a hook to keep the flowers suspended. Hang the flowers until all moisture evaporates. Drying will take two weeks or longer. Flowers are dried when they have a paper-like texture. Place dried frangipani flowers in a vase for decoration or use in crafts such as scrapbooking. Handle dried flowers with care, as they can easily fall apart. Wrap dried flowers in paper and store in a small box with holes. Poke holes through the box in the top, bottom and sides using the tip of a pair of scissors. Dried frangipani flowers should be kept away from direct sunlight.